Take out a rather big bowl and mix milk, flour and eggs together while beating it all with a whisk until evenly distributed. Then melt about 3 tablespoons of butter or margarine, preferably in a flat frying pan with a diameter of approximately 20 cm (0.2 metres). Add, while beating, the melted butter and salt to taste (about 1 teaspoon should be enough). Now focus on the flat frying pan in which you melted the butter a short while ago. It should be rather hot. Add just enough butter to cover the flat surface. The butter should instantly start melting and making noise. If not, wait until it does. Stir a bit in the bowl with the Swedish Pancake mixture so that the flour that has sunken to the bottom gets evenly distributed again. Put about one small cup of mixture in the frying pan. The amount very much depends on the size of your cups and your frying pan. The pancakes should be really thin, the mixture should only just cover the surface, pretty much like crepes if those are familiar to you. Let the pancake fry until it starts to get dry on the unfried side. This should not take more than a minute or two. Take a look at the fried side by lifting the pancake's edge a little bit with a tool of your choice (the tool of my choice would be a thin, stainless steel, spatula with a wooden handle). If it is golden brown, turn the pancake over and let it fry on the other side as well. When both sides have been fried to a golden brown colour, your first Swedish Pancake is done and you should remove it from the frying pan to prevent it from getting burnt. Now, all you have to do is to repeat the steps that seems most logical for you to repeat, and continue to do so until you run out of Swedish Pancake mixture. Set a table for 4 persons. If you are more than that you have to make more Swedish Pancakes. Add in proportion to the recipe above. Use dinner plates, knifes and forks. The only drink possible with Swedish Pancakes is milk. The Swedish Pancakes should be eaten together with either the jam or fruit preserve of your choice or ice cream - or both. The rules are not strict here. The important thing is that you like it. Basically it should be sweet and rather unhealthy. Below is a list of suggestions based on what is most common in Sweden. Use them, combine them or make your own choice. Basically the problem with Swedish Pancakes can be narrowed down to the word "timing". The fact that it takes quite some time to prepare them causes a lot of conflicts related to the actual production. See below. How do I keep the family members calm during the production process? Tell them to clean up the mess you have caused in the kitchen. How do I stop myself from eating the pancakes straight away? Don't. The person making the pancakes, but only this person, automatically has the right to eat pancakes at the stove. How do I stop others from eating the pancakes straight away? Tell those who are not cleaning up the mess you caused in the kitchen to set the table. I can't seem to find any lingonberry jam in my local supermarket? Perhaps they are not called lingonberry in your supermarket. According to a visitor (thanks Mikael) they could also be called mountain cranberry, red whortleberry, or cowberry. 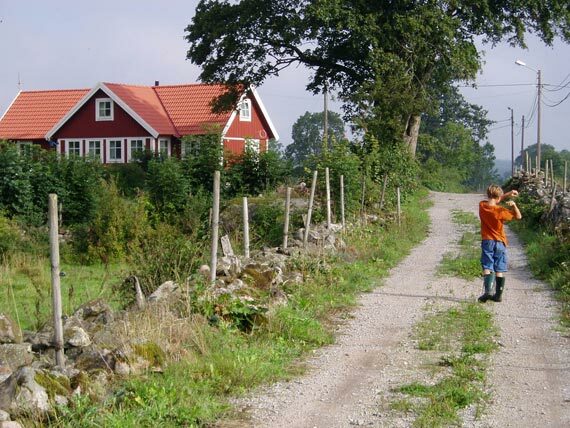 Another solution is to pick your own lingonberry in a nearby forest and make your own jam. 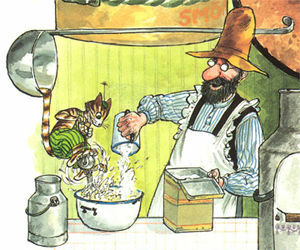 Some people have reported that the problems with Swedish Pancakes are simply too much for them to handle. For you guys the recipe Swedish Pancake In The Oven should come as a relief. It actually eliminates all the known problems with Swedish Pancakes up to this date. 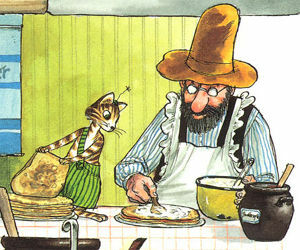 For the rest of you out there, with a more stable domestic situation, I can also recommend the recipes; Go Bananas With Swedish Pancakes and Birthday Cake With Swedish Pancakes. This is a very easy and effective way to cook a nice meal. But don't worry, not a lot of people outside Sweden knows this. You will still give the impression of being exotic and innovative enough to impress your ignorant friends and relatives. Just follow the steps below. It is the lazy way to domestic success. The recipe is for 4-5 persons. Make sure you have all the ingredients at home. The ingredients are basically the same as with regular Swedish Pancakes but with an optional addition of pork and/or apples. Before you start mixing all these things up, set the oven for 225° celcius. Set the oven to 225 degrees Celsius. Mix milk, flour, eggs and salt together in a big bowl until evenly distributed. If you are using pork, dice the pork of your choice into small pieces. If you are using apples, slice them into a convenient size. Pork users should now slightly fry the diced bits of smoked or salted pork (bacon is fine). After it has been slightly fried you can put it on a piece of paper. The paper will absorb the excessive fat from the fried pork which is a good thing because then you won't eat it and you won't get fat. Not from this pork anyway. Now, take a large form that will fit in your oven. It should be about 40 x 40 cm (0.4 x 0.4 metres). It should also have an edge of approximately 4 cm (0.04 metres). Then smear the form with butter or margarine. Stir a bit in the bowl with the Swedish Pancake mixture so that the flour that has sunken to the bottom gets evenly distributed again. Finally, pour the mixture into the form. Yes, all of it. If you are using pork, put the diced and slightly fried pieces of pork into the mixture in the form. If you are using apples, put some cinnamon on the apples and then put the apples into the mixture in the form. If you don't like cinnamon it is not vital to this recipe that you use it. If you don't like pork, apples, cinnamon or in fact most things, you can also do the Swedish Pancake in the oven au naturelle by simply leaving out whatever it is that you don't like. If you want to you can even put apples, cinnamon, and pork, all toghether into your Swedish Pancake In The Oven. After all it is your pancake, isn't it? Put the form with the Swedish Pancake mixture in the middle of the oven (that you have pre-heated up to 225 ° celsius) and let it stay there for about 15 to 25 minutes. The pancake is finished when it has a golden brown colour. Please note, that during the process the pancake might look as if it is swelling up and, from the look of it, may even explode. I assure you, this is not the case, it is only bubbles of air reaching for the surface and nothing to be afraid of. If this for some reason annoys you, you can pierce the bubbles with a fork (it's actually quite fun ). The observant reader has already noticed the immediate advantages of this recipe, particularly in the sense that it avoids all the at present date known problems with Swedish Pancakes. The Swedish Pancake in the oven is eaten in the same manner as regular Swedish Pancakes. 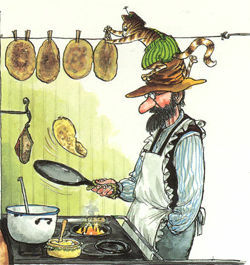 If you haven't read the part How To Eat Swedish Pancakes, now is probably a good time to do so. This is a very good way to deal with Swedish Pancakes. Travellers to South East Asia probably have experienced a similar version in the Banana Pancake, particularly in Indonesia it is served almost everywhere. This recipe should provide enough food for at least 4 persons and it is assumed that you are familiar with the section Regular Swedish Pancakes. Slice some bananas. The thickness of the slices should be about 2-3 millimeters. The amount of bananas you should slice depends on how many pancakes you are planning to make and how many slices you want to put on each pancake. Make an estimate and try to live with the consequences. One could say that generally you should follow the instructions in the recipe Regular Swedish Pancakes, just make sure that you are using either a teflon or at least some other kind of non-stick surfaced frying pan. If you are using a frying pan of cast iron the bananas tend to stick to the surface of the frying pan, making a mess of everything when you try to flip it over to fry on the other side. Timing is everything here, wait just a few seconds after the very moment when you have poured the mixture into the non-stick frying pan and then swiftly put the sliced bananas on top of the pancake mixture. The reason for this is, that by first letting the pancake create a little bit of fried surface we diminish the risk of the bananas sticking to the surface of the frying pan. This is particularly important if you are not using a non-stick frying pan, however, for some reason even non-stick frying pans can have things stuck on them eventhough their name implies differently. Now comes the really tricky part, and that is to turn the pancake over with the banana slices on top of the mixture. Chances are that the weight of the bananas will be uneavenly distributed on the pancake and that the pancake will fall apart because of this. The only way to avoid these kind of tragic incidents is to practice - a lot. Once you have managed the "turning over part", another tricky issue needs to be dealt with, and that is wheter or not the non-stick frying pan will let go of your pancake after the second side has been fried. Please note that the second side of the pancake has much more banana contact with the frying pan than the first side. If the pancake is stuck in the non-stick frying pan, then it may not be a non-stick frying pan that you are using after all, or it may not be a very good non-stick frying pan. If this is the case you are in big trouble. The only way to solve this is to be very forceful with your spatula. Let your frying pan know who is the boss. You may even have to clean your frying pan between each pancake you make if a lot of banana stuff has gotten stuck on it. You are of course not limited to the use of bananas as in the case above. In fact you can exchange the bananas with almost anything you want. I have tried it with crisp fried bacon and that was very nice, but don't let me or this recipe set the limits. Try frying Swedish Pancakes with papaya, raisins, apples or anything you want. Just remember that you are on your own here. Instant success could be just around the corner, but so could failure and shame. Experimenting on your own is not for the weak at heart, it could very well add new problems to the already known problems with Swedish Pancakes. However, for the brave, there are no limits. This recipe is based on the recipe for Regular Swedish Pancakes. In Sweden kids of all ages love this. It's a really good alternative for a birthday cake or on other occasions where kids deserve to be celebrated. Why not do it for absolutely no reason at all, just to brighten up your everyday life when you come home from your spectacular and interesting job. First, make Regular Swedish Pancakes according to the recipe above. Now, consider each Swedish Pancake to be a layer in a stack. Take the first pancake and put it on a tray or plate. Put jam, fruit preserve, whipped cream, mashed bananas or anything of your liking on top of the pancake. Put the second pancake on top of the first and continue to put more goodies on it. Repeat these steps until you have a nice stack of Swedish Pancakes with lots of goodies inbetween them. Too much goodies tend to make the stack unstable, therefore it is better to have lots of layers rather than too much goodies inbetween them. Garnish the top of the stack with fresh berries, whipped cream or both. Let your artistic talent flow. As you hopefully can see by now, a stack of perfectly ordinary Swedish Pancakes has turned into a beautiful cake, or at least something resembling a cake. Serve instantly with ice cream or whipped cream. If you want to share your experiences with this recipe, it's highly appreciated.